Here's another price cut as Flagship Yachts say there's a €1 million price cut on the 36.5m motor yacht Doubleshot, jointly listed with Fraser Yachts. She is part of Tecnomar’s latest Velvet 36 range of planing yachts and was delivered to her owner in May 2011. He commissioned Ioanna Marinopoulos for interior design and exterior styling which in turn created an aggressive look with radical structural changes to the yacht’s profile making Doubleshot stand out from the rest of the Tecnomar fleet. She features an amazing contemporary Art-Deco interior with accommodation for up to 10 guests in a full-beam owners' suite, two VIP cabins and two guest cabins, alongside six crew. Doubleshot is propelled by two 2,800hp MTU 16V 2000 M94 engines to a top speed of 32 knots and cruises at 28 knots. 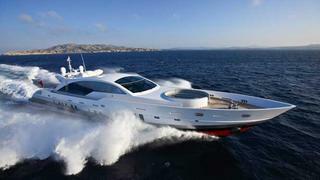 A finalist in the 2012 World Superyacht Awards, Doubleshot is now asking €7.2 million.